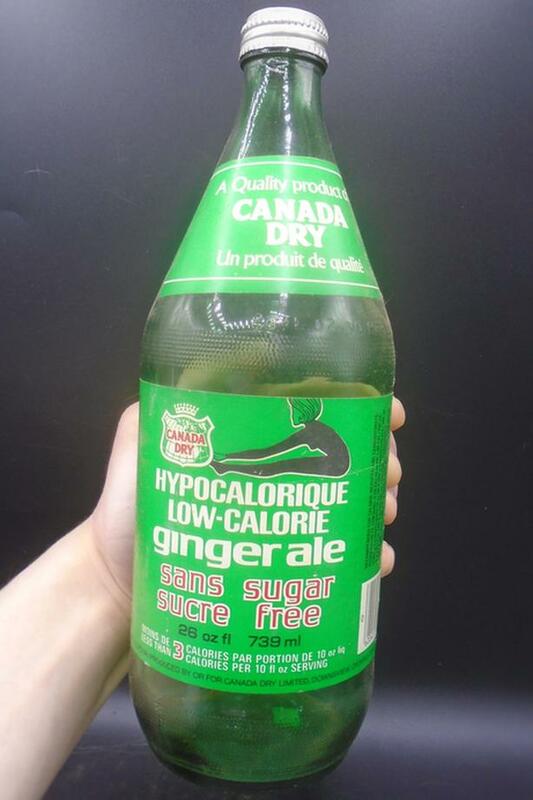 Vintage 1970's Canada Dry Sugar Free Ginger Ale (26 oz.) Paper Label Soda Pop Bottle. Canada Dry Limited - Downsview, Ontario. This is an EMPTY bottle from the year 1976-1986 for collectible purposes or display. Very good condition. There are some minor scratches and some minor scuff marks on both of the paper labels. Bottom label has an area of stain on the bottom left corner. Overall excellent condition. Very clean & displayable. Colours are vibrant and the bottle is glossy and shiny. There are no chips, cracks, or any scratches on the glass. Embossed contents on shoulder. Bi-lingual. Scarce bottle. Good addition to any vintage soda pop bottle collection. Measures approx- 9 1/2" inches in height, 3" inches in diameter, with a 1" inch screw-cap lip. Maker's mark "C in triangle" for Consumer Glass Company. PLEASE TAKE A LOOK AT MY OTHER LISTINGS! JUST CLICK "VIEW SELLER'S LIST" AT THE TOP RIGHT SIDE OF THE SCREEN! LOTS OF VINTAGE SODA POP BOTTLES!